Hondon Villas: Business of the Year! 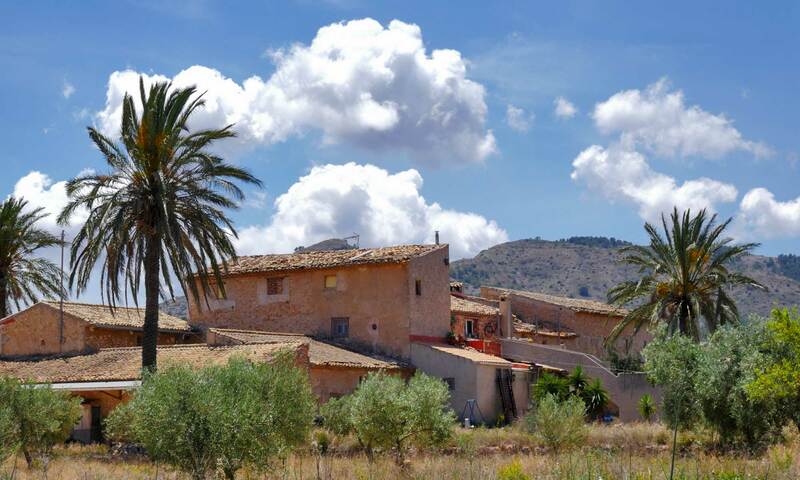 Novelda is about 25 minutes from the Hondon Valley and 20 minutess from Alicante airport. It is often overlooked by foreign visitors which is a shame as it has a long history and significance for the local community and culture. Particularly for industry (agriculture and building), the local economy and historic architecture. Watch the video or visit The Novelda Tourist site for up-to-date information. So, in the Middle Ages, Novelda had two population centres, one on the hill of La Mola (there’s a castle & triangular Keep there) which was eventually abandoned to make way for the current location of the city we know today. B) the packaging and commercialisation of spices (especially saffron), condiments and infusions. C) the cultivation of grapes, the uva embolsada for wine and eating. The Novelda grape farmers use an innovative “paper bag” technique to delay the grape harvest until winter, being these the typical grapes that people consume around Christmas and the New Year’s Eve celebrations. Sanctuary of Santa María Magdalena. Undoubtedly, any travvler to Novelda should make a visit to the premier building in the area: The Sanctuary of Santa María Magdalena. 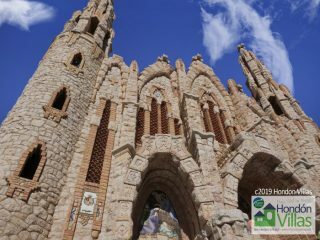 This religious building was built from a project drawn up by the novel engineer Don José Sala Sala who imbued his project with the Catalan modernist style. Its construction, begun in 1918, required three phases, to complete the work in 1946. In the main façade there are two 25m high lateral towers, culminated by a stone cross, which is also found in the dome and on the upper arches of the façade. The decorative reasons would have antecedents in the medieval styles, baroque and in the own nature; influences that led the author to combine pebbles from the Vinalopó river, polychrome tiles, bricks, reddish colors, masonry, etc., which are reflected throughout the exterior of the building. The interior is composed of a rectangular central nave with two attached side spaces, that is, an original base with the shape of a glass of ointment, a container with which, according to the Christian tradition, Mary Magdalene anointed the feet of Jesus Christ. In the background, in the apse, is the dressing room of Santa María Magdalena, copatrona de Novelda, and behind the altar we can admire a beautiful painting attributed to Gastón Castelló. 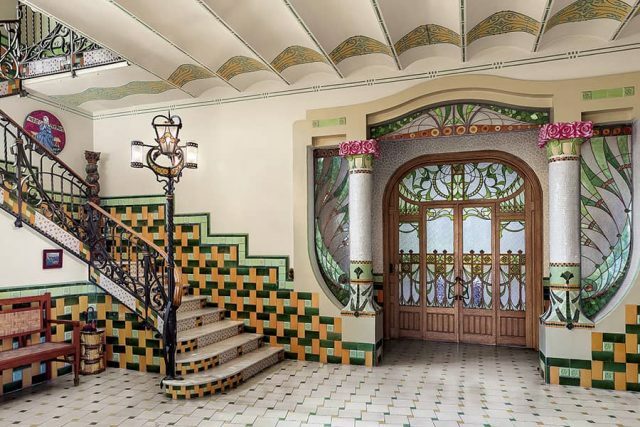 Novelda architecture is know for it’s Modernism design history, being an embellishment of arty and excessive shapes and curves with soft and delicate waves, where flower and vegetable elements are found. The Casa-Museo Modernista is a good example of this and well worth a visit. Here and around the town you will see this in sculpture, painting, printing, literature, music and other artistic spheres. The local society developed towards a landowner upper class with their riches, political and social levels, the benefits obtained via the local agriculture, commerce and financial activities. With that wealth came ever more fancy building and decoration. Curiously, in this town we find three of the best examples of the Modernist style in the Valencian areas: The Casa-Museo Modernista (24, Mayor St. – website here), the Centro Cultural Gómez- Tortosa (6, Mayor St.) and the Casa Mira (San Vicente St.), being the last one a private house and not open to visitors.